January 1, 2018 Soke John H. Casarez passed the Manabi-Masho Ju-Jitsu system to Grandmaster Mark Murdock and Master Allen Wilson. The system was renamed Casarez Manabi-Masho Ju-Jitsu in honor of it's founder. Grandmaster Murdock and Allen Wilson became Soke of the system. 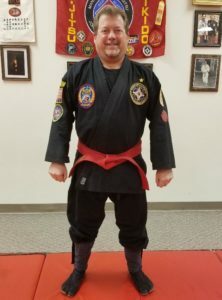 In November of 2018 Grandmaster John H. Casarez decided he wanted to teach a little bit on the side as a hobby. At that time he became Soke again and Grandmaster Murdock and Allen Wilson's title temporarily went back to Soke-Dai due to him teaching again. These titles will remain until Soke Casarez decides to stop teaching or passes away. I will gladly go back to Soke-Dai to have the privilege of seeing Soke Casarez teach again. March 15, 2019 will make 70 years in martial arts for Soke Casarez. Soke Casarez will turn 82 this year and still enjoying share his knowledge. This man is a legend in the martial arts. It's a great privilege to have trained under him for nearly 40 years. Currently Master Wilson is not teaching the system in it's name, but continues to teach select techniques that he included in his system. Soke-Dai Murdock is currently training his own Soke-Dai to take over for him one day. Head Soke-Dai of Casarez Manabi-Masho Ju-Jitsu.